This morning’s Facebook page for the Advance Hornet Alumni carried a bunch of photos of the 2013 Alumni Banquet. Mother is down in Austin floating around in Niece Kim’s pool, so she didn’t attend. 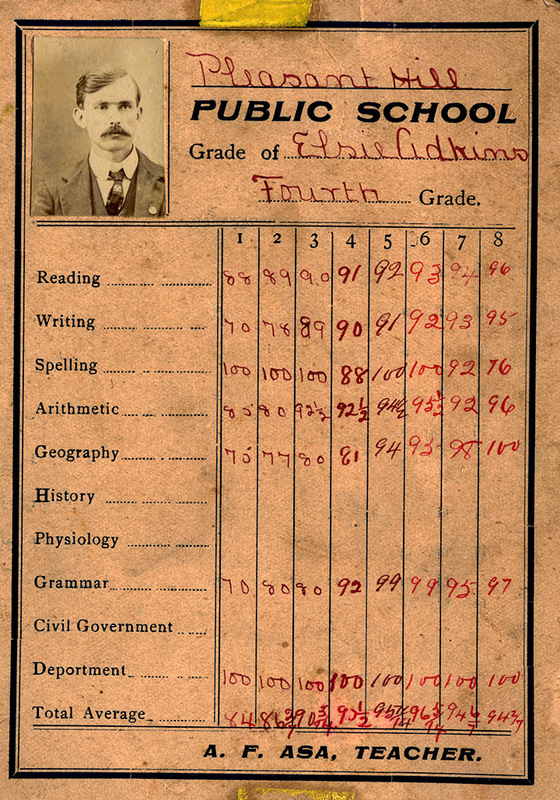 I was looking through some old Advance scans when I ran across my Grandmother Elsie Adkins (Welch)’s 4th grade report card. Looks like she showed steady improvement every month in everything but spelling. Maybe the words got longer as the year went on. How do you like that 100% rating in deportment? She was a feisty thing, so I’m surprised she got those perfect scores. 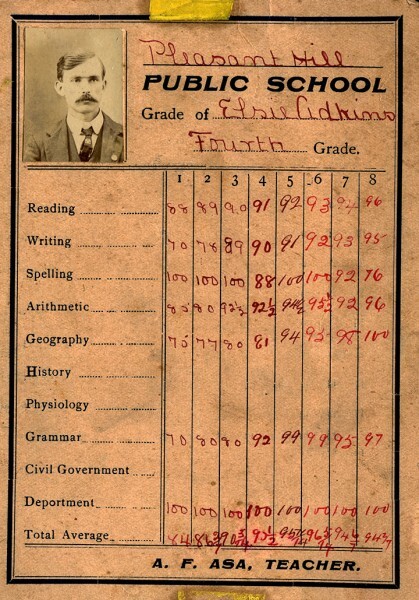 Who would have thought the teacher’s photo would be on the report card? 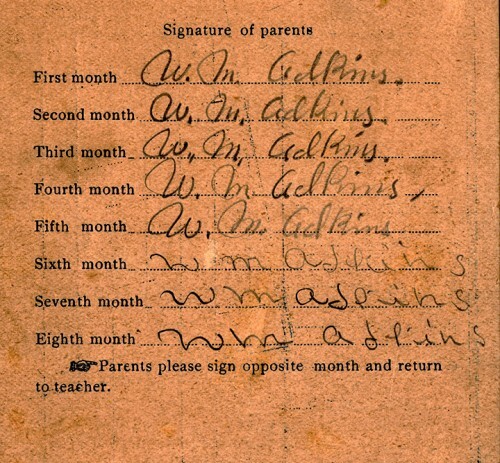 Pupils were rated monthly and parents had to sign the card. My great-grandfather’s signature was consistent the first five months, but changed in months six through eight. 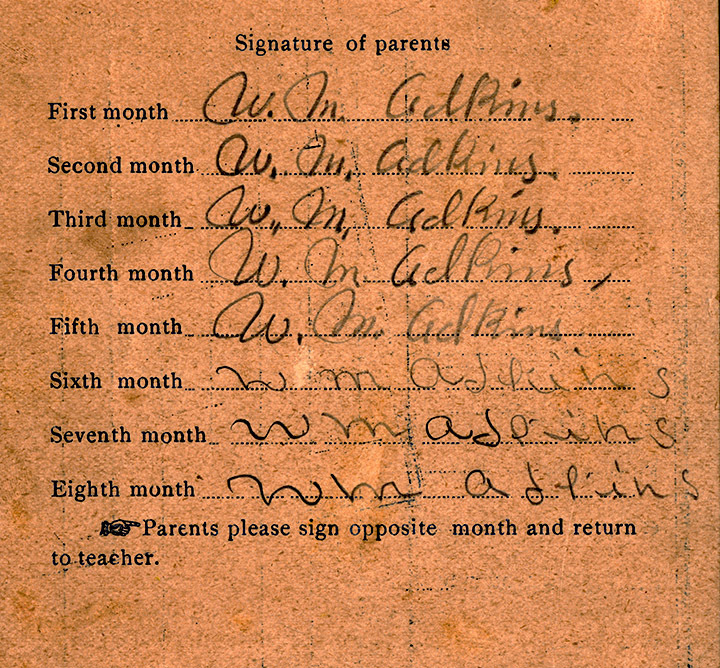 If her grades had dropped, I might accuse my grandmother of forging his signature. Elsie Adkins Welch was an extraordinary woman for her time. It’s worth a read. Great-grandfather was right handed and Great-grandmother was left handed. In the past matron photo, my Mother, Daisy Zimmerman is on the left behind the candle. Your grand mother and my Mom were very very great friends. I spent many days with her. Love the picture of Roy with the cigar and the little boy. I remember Daisy well. She was always fun to be around. The “little boy” in the photo of Roy Welch was me. This is Mary, here. How cool to have this! I recently discovered my paternal grandfather’s mileage log book. He died when my dad was just 13, so I had never seen his handwriting before that. A treasure, for sure!